Full walkthrough solution for "Escape Challenge". 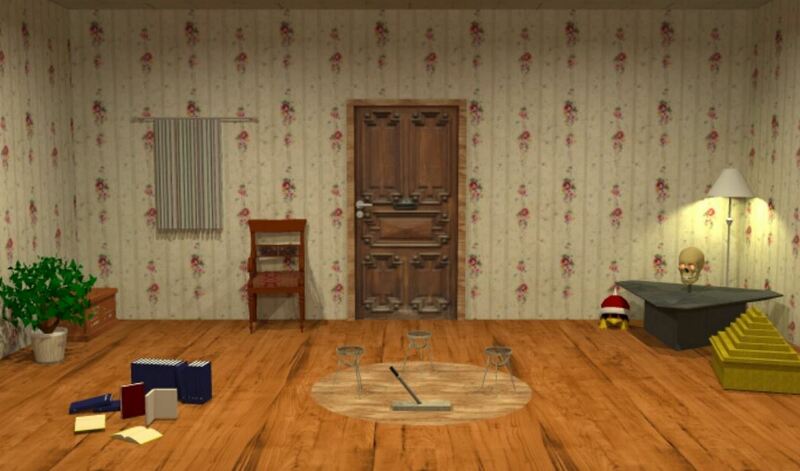 Detailed explanations including tips, tricks, and help to solve the first 10 levels of Escape Challenge. This walkthrough guide is developed for the Android version, but the methods will be applicable to other platforms, although the screen prints might be slightly different. Solutions to levels 6 to 10 can be found here. 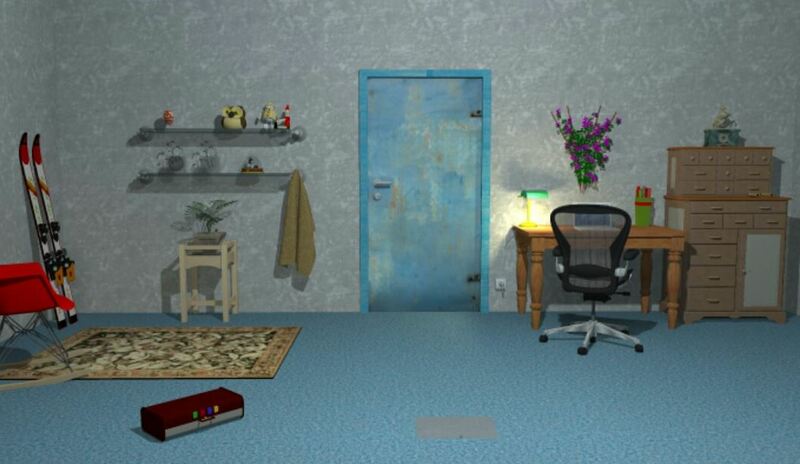 Level 1 is more a tutorial on how to play Escape Challenge. Not much of a challenge here... just follow the instructions. Tap the cabinet on the left. Tap the bottom drawer to view the note. Insert he number you saw on the note, but tapping the astrix's (*). Tap the cabinet handle then take the flashlight. Zoom in on the painting above the couch. Notice the light area at the base of the couch. Zoom in on the base of the couch as per the painting. Select the flashlight then shine below the couch. The door will open. 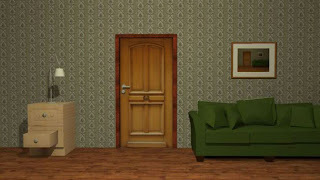 Tap the door and level 1 will be solved! Zoom in on the painting on the wall. Take the green circle object on the top right corner. Tap the drawer handle and the drawer will open. Take the key. Open the cabinet to the right of the door using the key. Take the yellow half-moon shape object from the top compartment. You need to tap each pin from left to right using the code 2103 you saw in the bottom compartment. Tap the 2nd pin until it drops down, then tap 1 more time. Tap the 3rd pin until it drops down, leave it to represent 0. Tap the 4th pin until it drops down. Tap it 3 more times. Now zoom out, then tap the top of the pin container to open. 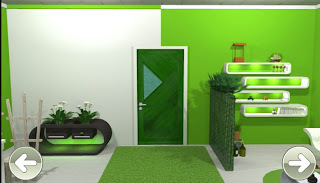 Take the green square shape object. Zoom in on the bottom drawer. Tap the handle to open the bottom drawer. 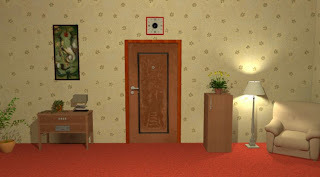 Use the door key on the front door to solve level 2! Take the screwdriver from the set of drawers on the right. Notice the Green #5 on the scroll next to where you got the screwdriver. Zoom in on the brown box on the floor. Open by adjusting each color to its corresponding number,. Green = 5, Red = 2, Blue = 4, Yellow = 3. Tap the handle to open, then take the key. Zoom on on the top left part of the shelf. Open the egg-shaped holder using the screwdriver. Open the locked cylinder inside using the golden key. 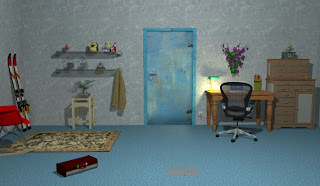 Use the blue key to unlock the door and level 3 will be solved! Zoom in on the area below the shelves on the right. Take the red pliers. Zoom in on the 2nd from bottom shelf. Take the yellow triangle shape, by moving the car. Solve the brown pyramid puzzle. This is an easy puzzle. A square in the pyramid is the product of the 2 squares below it. So the top will be 168 because 12 x 14 = 168. (Pascal's Triangle). Once you entered 168, tap at the base of the pyramid to open the compartment and get a memory stick. Zoom in on the right-side drawer below the plants on the left. Use the memory stick top open the drawer. Zoom in under the table. Attach the hook to the box. Use the pliers to unclip the key. Take the key. Use the key to open the left side drawer under the plants on the left. Take the 2nd yellow triangle shape. Zoom in on the area below the shelves on the right. Insert the 2 triangles on the yellow container. Open the container and take the remote. Zoom in on the cover against the wall, left of the table. Use the remote on the receiver to open the cover. Go right and use the door key on the door to solve level 4. Zoom in on the brown chest in the top left corner. O + D = 7 can only be 6 + 1 (D can be 1 or 3 as per the previous line, and 4 is used by V). U + O = 9 then works with U = 3 and O = 6. Enter this code, then open the top of the chest. 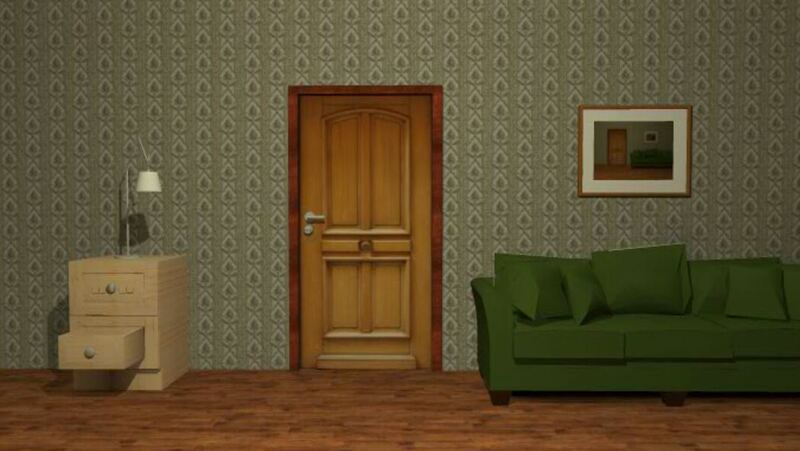 Open the curtain to the left of the door and solve the rotating-piece-puzzle. Rotate each piece in the 4x4 puzzle until it is oriented correctly. Open the puzzle and get the 2nd egg. Zoom in on the skull on the right on the table. Adjust the skull's eyes as per the 3-lines and circle clue. Left eye should be 3 horizontal lines. Right eye must contain a circle. Take the key from the skull's mouth. Open the yellow pyramid box in the right using the key. Take the 3rd green-and-white egg. Zoom in on the center area on the floor. Insert the 3 eggs. Each egg got its specific location. The screen will shake and you will see a table. Take the key below the table. Well done on completing the first 5 levels of Escape Challenge. Next 5 level's walkthroughs can be found here.